Ramy Ashour, professional squash and ’10 world No. 1 player, visits Harlem | HarlemGal Inc.
A reader sent in a wonderful picture to share with us all of professional squash player Ramy Ashour visiting Harlem “for the first time” Jan. 28 to meet with StreetSquash.org participants from Harlem. How cool/international is this? Totally cool, in my book! Why is Ramy Ashour in New York? According to our source, he had just won the Tournament of Champions (TOC), which ended on Thursday, the 24th. It’s a huge tournament that is held every year in January in Grand Central Station with the top players, both male and female, coming from all over the world. 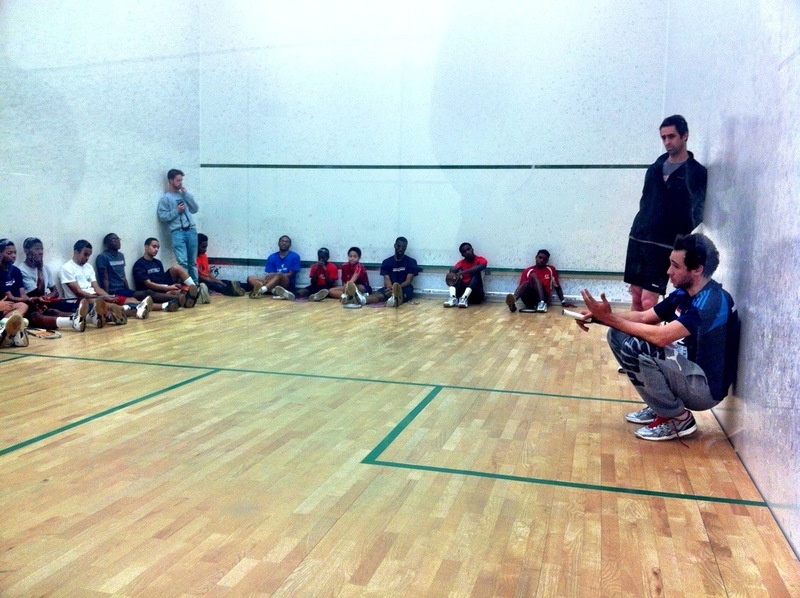 The purpose of Ashour’s visit to Harlem was to speak with StreetSquash kids about his life and then do a Squash clinic. Ashour won the TOC and then went to StreetSquash in Harlem. According to Google, Ramy Ashour, a pro from Egypt, reached world No. 1 in January 2010 after beating Nick Matthew in the final of the 2009 Saudi International Squash Tournament. To learn more about Ashour online, follow him on Twitter. StreetSquash is on 116th Street between Fifth and Lenox Avenue! This entry was posted in 116th Street, Community, education, Events, Harlem, health and wellness, kids, Sports, Youth and tagged @RamyAshour, Harlem, Harlem Kids, Harlem Squash, Harlem Youth, Photo by Joe Kazemi, Ramy Ashour, Sports, Squash, Street Squash, StreetSquash.org. Bookmark the permalink.